The Kansas City Chiefs cruised past the Cincinnati Bengals on Saturday night, behind an impressive performance by their quarterback duo of Alex Smith and Patrick Mahomes, the latter of whom tossed two touchdown passes. Chiefs RB Charcandrick West topped 100 yards on just seven carries and the Chiefs took advantage of an Andy Dalton, AJ McCarron-led Bengals offense that only mustered four field goals, in a 30-12 Chiefs victory. With that we give you our PFF exclusive takeaways from the contest for each team. The Chiefs first-round pick had a solid night completing 71 percent of his passes for a pair of touchdowns while adding 29 yards on just three carries. Mahomes showed his athleticism outside of the pocket and displayed the arm strength that caught the NFL’s attention before the draft. Mahomes’ most important statistic of the night however, was having a “Zero” in the turnover column. He finished the evening with an impressive 83.3 adjusted completion percentage. Kansas City ran all over the Bengals defense tonight for a total of 228 yards. West was a huge part of that attack rushing for 113 yards on just seven carries. 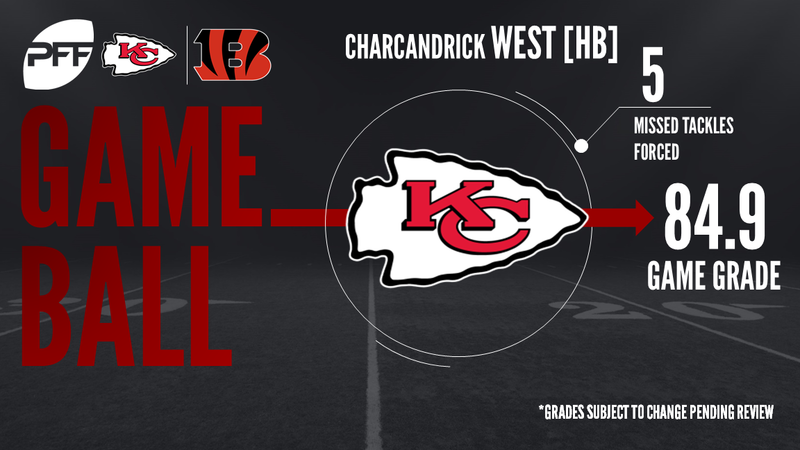 West displayed his vision and shiftiness, combined with some poor tackling by the Bengals defense, to lead the Chiefs with over 16 yards per carry and an absolutely ridiculous 428.3 elusive rating on five forced missed tackles on his seven carries. The Chiefs’ second-round draft pick led the team with four total pressures — all QB hurries — and added a stop in run defense. Okine played just eight total snaps, which is why he wasn’t listed among the top five grades. However, he had a sack and two hurries on just seven snaps of rushing the passer. He finished the game with a ridiculous 35.7 pass-rush productivity mark. Erickson played just 11 snaps, but he caught all three targets thrown his way. Those combined for 43 yards, including back-to-back first downs at the end of the second half to set up a Cincinnati field goal. Erickson saw a 118.8 passer rating when targeted in the game. The rookie did not have as productive of a performance on the ground as his first game, gaining just 16 yards on six carries. He did, however, have a 15-yard pass reception on which he forced his lone missed tackle for an elusive rating of just 26.2 on the game. Smith was a force coming off the right side for the Bengals in the second half. While the majority of his work came against the Chiefs backup offensive lineman, these are still NFL players, and Smith abused them. Despite only having one sack on the stat sheet, Smith made his presence felt with five pressures, a tackle for loss and a 29.7 pass-rush productivity mark. Willis operated on the opposite side of Smith and together they collapsed the Bengals line on top of their quarterback’s lap. The Chiefs were lucky to be up early in this one as they were able to run the ball most of the second half. Willis racked up two pressures on 13 pass-rush snaps for a 13.7 pass-rush productivity.